This centrepiece piece is made of black satinized glass with relief droplets on a blue field. It is made with a glass fusion technique, using oxides and reagents, which provide an original evocative material touch. Very light in its transparency, the decoration of this refined glass plate is designed to reveal a ring of turquoise drops that frame and guard the mother-of-pearl in the centre. These fine rectangular glass plates witness realistic evocations and aesthetic references to the volcanic stones, obsidian, basalt and lava flares. 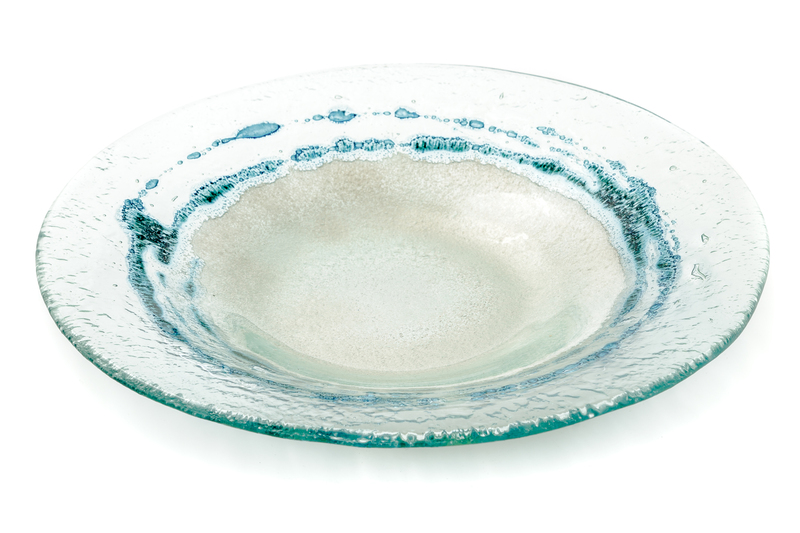 This centrepiece features sophisticated colours, ranging between blue and green, crafted through the glass fusion technique. 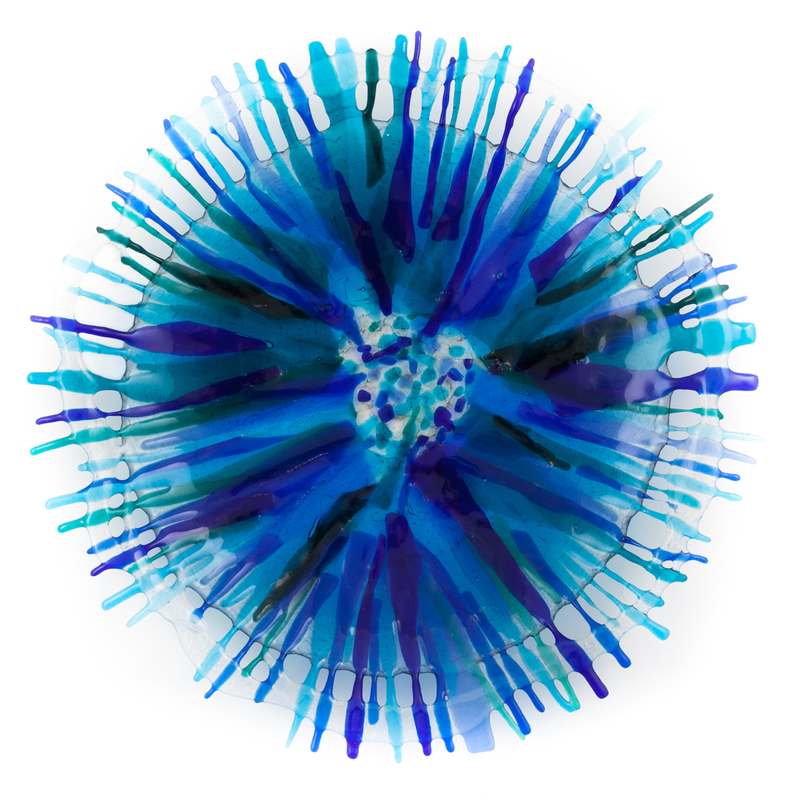 The artefact has the shape of an anemone and it is inspired by the colours of the marine world. 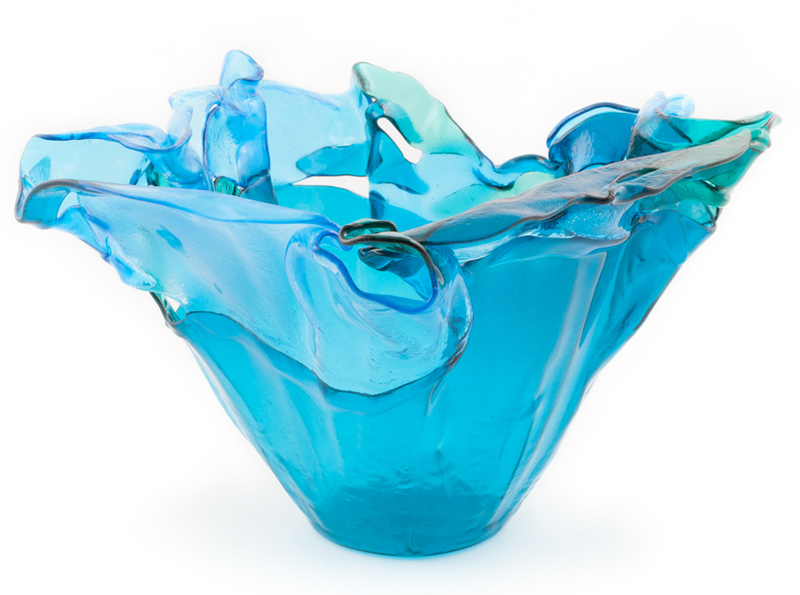 This glass vase has a plastic shape and vibrant light blue shades, crafted with the glass fusion technique. Studio Vetrarte was founded by Francesca Tedesco and Silvio Sotgiu in 1987. They both had already experience in the artistic glass field, and decided to join to combine their professionalism, knowledge of techniques and materials, design skills and artistic sensibility. Over the years they have made several public and private works, collaborating with I.S.O.L.A. for the production of quality collections, among other things, participating in an initiative promoted by the Region of Sardinia, Domo, XIX Biennial of Sardinina craftsmanship , winning the event in 2011 with the prestigious Compasso D'oro award. 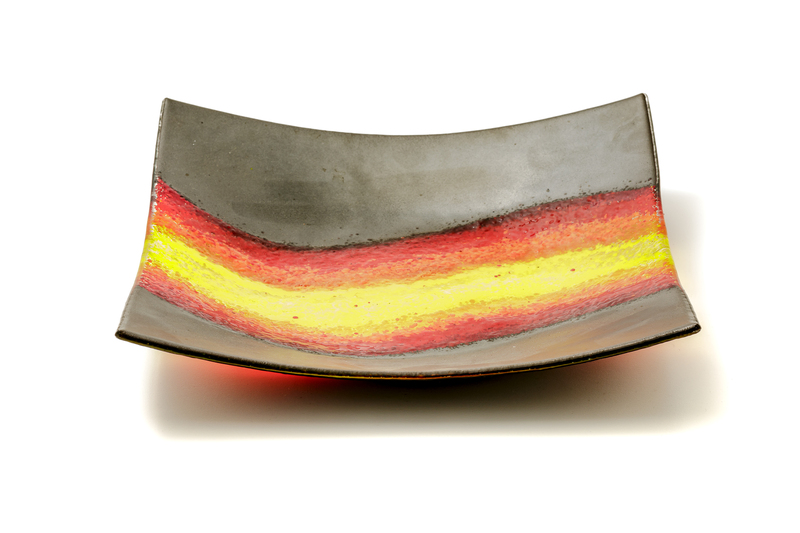 For several years, Francesca Tedesco has worked as a professor of decoration at the Academy of Fine Arts of Sassari in the field of glass processing using traditional techniques, such as mosaic, the Tiffany glazing tachnique and the sophisticated techniques of hot fusion and casting. Studio Vetrarte merges the purity of the glass and colours, creativity and passion, giving rise to new charming forms. The production is divided into several production lines, characterized by different techniques and purposes: furnishings and tableware, lamps of different shapes, wall lights and chandeliers, made with the Tiffany, glass fusion or mosaic techniques, mirror frames, glass doors and partitions, sacred art and decorative panels. Jewels and necklaces, made with the "a lume" technique, using precious Murano glass beads to obtain sophisticated decorative effects. The stained "high fire" decorated glass windows have a great artistic value, are custom-made, designed to decorate large and small spaces. For glass processing techniques both traditional and cutting edge techniques are used . Plumbing is used to join pieces of large and small stained glass windows; the Tiffany technique, a version of plumbing technique that replaces lead with a thin copper foil, used for lamps and small decorative objects; the mosaic technique, that uses small pieces of coloured glass, is used for furnishings and decorative panels; the fusion and the moulding techniques, performed at high temperatures, are used to craft furnishing accessories of various types, decorative panels and objects of daily use. The a lume technique is used for the creation of glass beads, used for the production of necklaces and jewels.